1. Prepare yourself, your room, your content and your audience in advance to avoid these situations. 2. Have a working understanding of the different levels of situation instigators and know how to handle each. 3. If you do have to engage a disruptive audience member, be as cordial and pleasant as possible. Do not allow an unpleasant person make you or your presentation’s experience turn unpleasant. You can’t always prevent the storm, but you can remain calm during it. Before your program, build rapport in the room; learn names, be in the audience members’ space, ask questions, learn expectations, etc. If you sense there might be resistance in the room (or if you have been told directly), plan accordingly. If it is one or two people, approach them before the program and discuss options. If it is a large portion of the group, build strategies into your presentation to deal with that reality: use inclusive language, speak to the facts, stand your ground, respect other opinions, don’t pass the buck, be cordial, etc. The Passive Dissenter does not mean harm. Their behavior is disruptive, but they are not intentionally trying to hurt your presentation. They are more than likely simply unfocused or distracted and need to be more directly engaged in the program. Catch them at break or when the big group’s attention is on something else and point out how their behavior is disruptive. Ask them how they could adjust their behavior to better fit the needs of the group (let them come up with the solution first.) Give them a purposeful, if even passive, responsibility. Ask them to be a small group discussion leader, help with a small logistical item, think about some new ideas for the current discussion, etc. The Aggressive Dissenter is looking to be disruptive, but not because of you. Their dissention is an outward expression of some inner strife: personal, professional, emotional, social, etc. There is a possibility they can be brought back. When you have a break, approach them one‐on‐one and in private and bring the results of their behavior to their attention. Ask them if they are willing and able to set their personal agenda aside for the betterment of the group. They also need a diversion to get their thinking and emotions back with the group. Let them know you are interested in them, but will not sacrifice the goals of the presentation or the interests and safety of the group. The Aggressive Combative is out to get you; either because of you personally or because you happen to represent the focus of their aggression. They need to be dismissed as soon as possible. If you can, have someone else in an authoritative position do this for you and then move on. If not, then handle it yourself cordially at first, then aggressively if you must. Never physically though. Always leave a safe zone between you and the Aggressive Combative. The BIG IDEA driving all of these strategies is control. Once you lose control or are perceived as losing control, you lose your audience’s trust. Once that is gone, everything is gone. The Surgeon Rule - Know Your Tools. You are in the unfortunate position of needing surgery. Its not the favorite chapter in your life, but you know you have to go through it. The last thing you remember thinking before you slip off to la-la land is, “Goodnight room. Goodnight moon. Goodnight life.” You are scared to death you will not wake up. You have been given a rookie surgeon. This scenario will, of course, never happen. Unless our modern health system goes entirely off-course, surgeons not only know how to use the tools of their trade, but they will be complete masters of them. You wouldn’t even consider going to a doctor that didn’t have hours of experience and absolute confidence using their tools. So, why would any presenter ask their audience to sit through a presentation where the speaker didn’t know how to use their stuff? Authenticity Rule #4 states: Your authenticity can show through more powerfully when your presentation tools become natural self extensions. What are the downsides of not having total command of your tools? Damages Credibility – Trust between you and your audience is the foundation of everything. The moment you are vulnerable because of a lack in competency, that foundation begins to crumble. We don’t care if you are perfect, but we do expect you to care about being close. Distracts – You can only have your focus on one thing at a time. That one thing should be connecting with the audience. If you are wasting your “one thing” on how to get your laptop to talk to the projector, someone in the room is getting ignored. Plus, you want your audience’s attention to be on the message and how it applies to their life, not on the flipchart that keeps falling down because you didn’t think ahead of time to bring push-pins with you. Drains Time – Your audience has chosen to give you two of their most valuable resources – their time and attention. If you don’t spend time before the presentation getting your tools right, you will have to waste time during the presentation doing it. This is disrespectful to your audience and is the same as saying to them, “My time is more valuable to me than your time.” Not good. How do you get better at using your tools? Learn Great Techniques – Read some books, blogs, tweets, etc. written by ninja level presenters. Seek these people out personally and ask them how they use ____ successfully. Here is a great portal for finding great presenters – Speaking Alltop. Practice – After you learn good techniques, practice them. The best speaking practice is in front of an actual live audience. In front of the mirror is better than nothing, but not the best practice. After you finish a presentation, sit down right then and do a Plus (what you did well), Minus (what you didn’t do well), Delta (what you are going to change or find out how to change) list. "You were impossible to ignore!" My first thought after she said this was, "So, what you are saying is that you were trying to ignore me, but were unsuccessful?" Seriously though, she went on to say that it was one of the most engaging 25-minutes she has experienced from a convention keynote speaker and she has seen a good number of us. The first half consisted of humor (wit, not jokes), building rapport by telling a quick story about an experience I had that they are currently going through and two quick full-audience interactive activities. There was zero space in the first 12-minutes to be physically, mentally or emotionally disengaged. It was boom-boom-boom. The second half was the content - the title of the keynote was The Three Giant Jumps to Have a Giant Leadership Journey. Everything about the content pieces revolved around there being three jumps. This repetition built in anticipation to find out what the three were going to be. This anticipation added to the "impossible to ignore" effect. Each of the "Three Giant Jumps" were in story form (Reverence, Remarkable and Risk). If I had more time, I would have included another full-audience interactive activity to support the second point. Because the points were supported with fast paced, interesting, colorful and emotion-based stories, the “ignore factor” was diminished by the power of the story – built-in start/middle/end, easy to understand reference points, and unique (two were stories from my life and one was from a friend’s life). "I am excited and interested to be here, even if you aren't. And if you aren't, I'm not going to yell at you or try to push into getting there, we are just going to have so much fun and get so much done on this side of the fence, that you will eventually want to jump it yourself." This energy strategy results in us being able to pull the audience up to our level of attention, involvement, excitement, joy, etc. It is very difficult to ignore someone who is fully invested in the moment and is armed with effective strategies to motivate that same level of investment from the audience. 1. Shut down your mass weapons of distraction. 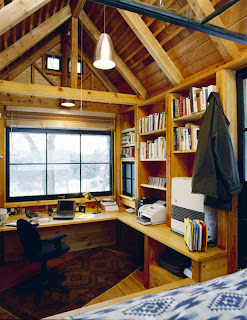 Phone, email, Facebook, twitter, visitors, TV, web browsing, etc. These elements are designed to attract and control your attention. Unless you have the will power of a Supermonk, shut them off. Give your focus a fighting chance. 2. Find a physical location that has built-in distraction minimizers. To achieve number one, you might need to do number two. 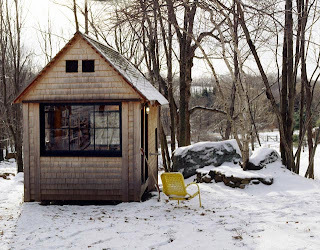 Michael's Writing House works because of the recluse nature of the structure itself. It is physically removed from people, possibly Internet, etc. From the look of it, he pretty much has access to a handful of books, his laptop, a printer and oxygen. When I was in college, this was the fifth floor of the library. Your options are endless if you choose to seek them out: a restaurant, a library, a neighbor/friend's house, your backyard, the hood of your vehicle in the middle of a field, etc. 3. Surround yourself with sights, sounds and smells that inspire YOU. I don't know, but I would venture to guess that Micheal is inspired by nature, especially since he is a green movement advocate. 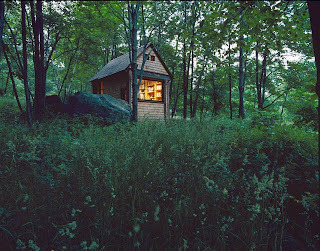 His Writing House is built of natural material and looks to be in the middle of Sherwood Forrest. These sights, sounds and smells are simply muse fuel. There might even be a certain time of day where he is most prolific. You need to do some self-evaluation and figure out what sights, sounds and smells most inspire you to be creative and/or ultra productive in solo projects. It might be in the middle of a bright, loud, and busy cafe or it could be in your grandma's dark, damp, and quiet basement.